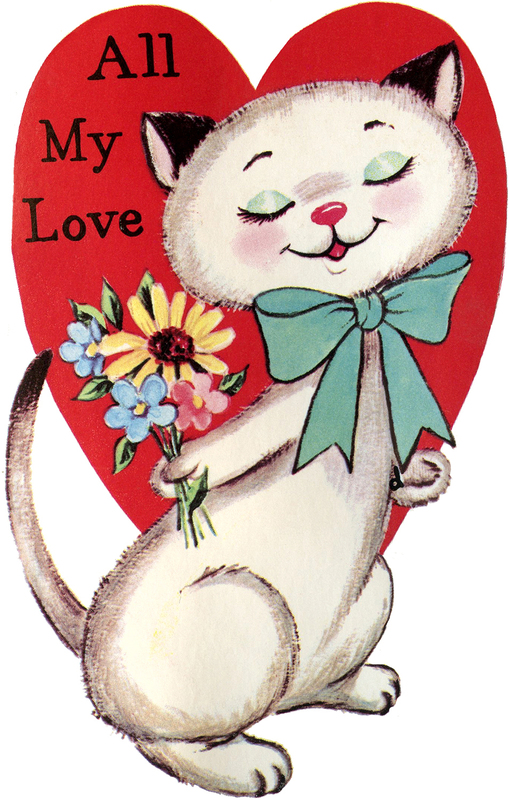 Today I am sharing a cute and fun collection of 9 Retro Valentines with Animals. It is free clipart for you! The 9 image set is a curated assortment of retro Valentine’s Day card graphics. I begin with three adorable Valentines with delightful cats with ‘purrfect’ greetings. Next there are four sweet antique cards featuring a bluebird, bunny, butterfly, and goldfish with their Valentine hearts. The collection finishes with 2 vintage black and white Valentine card graphics. These Valentine cards are perfect for Handmade Cards or Valentine’s Day Craft Projects. This is a fun Vintage Cat Valentine Image! Shown above is a cute White Cat wearing an Aqua bow around her neck! She’s holding a bouquet of flowers and is framed with a big red Heart. 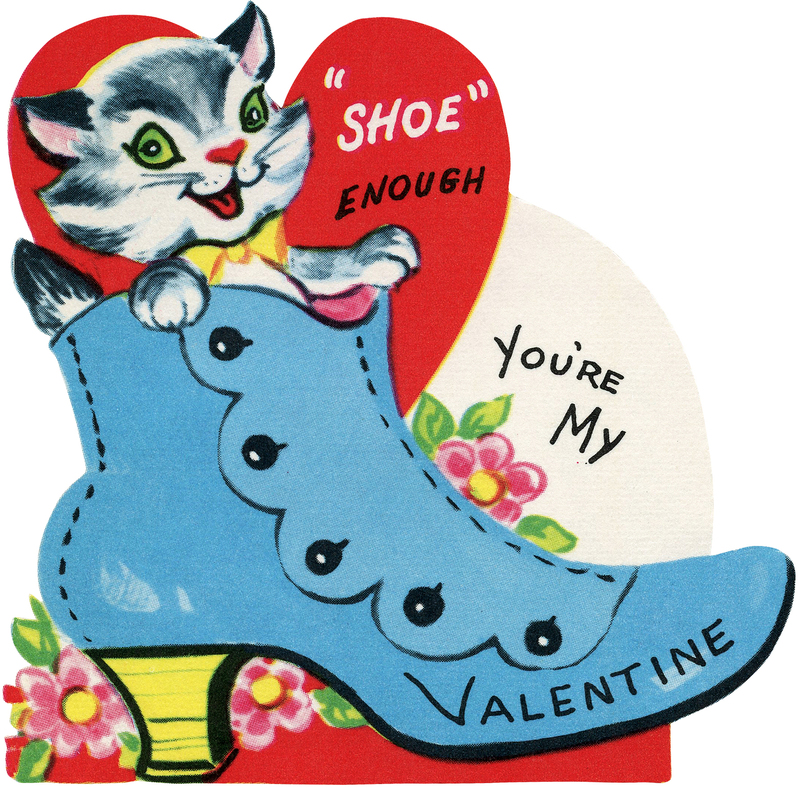 Next, I’m sharing this Retro Valentine Cat in Shoe Image! This cute little Vintage Valentine shows an old fashioned High Button Shoe with a funny, smiling Cat inside of it. The Kitty has bright green eyes and is wearing a sunny yellow bow tie. This is a cute Retro Cat Valentine Image! 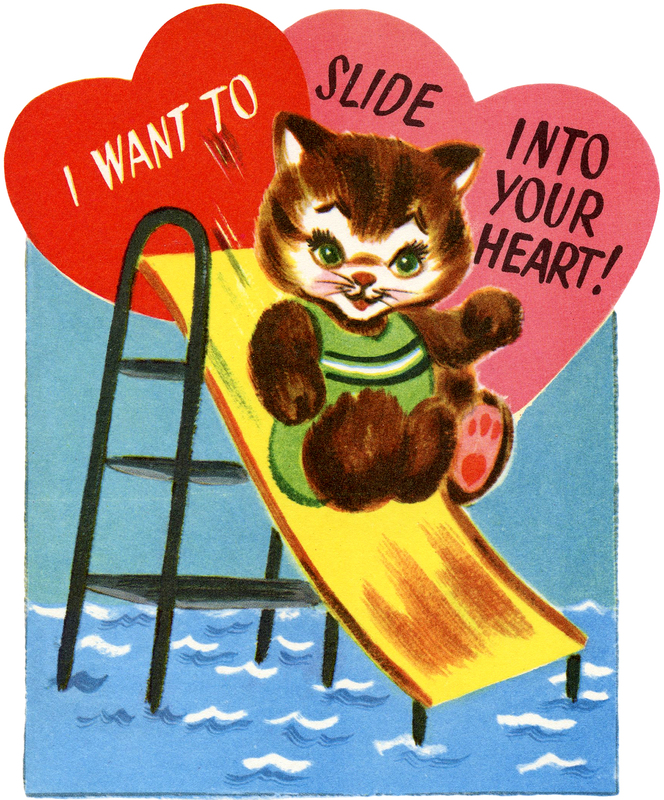 The adorable Valentine shows a happy little Cat sliding down a pool slide! This one was scanned from an old Circa 1950’s Valentine Activity book. There is no copyright date in the book and it does not appear to have ever been copyrighted. Shown above is an adorable Retro Valentine Graphic! This is a Red Heart with a cute Bluebird and some flowers! 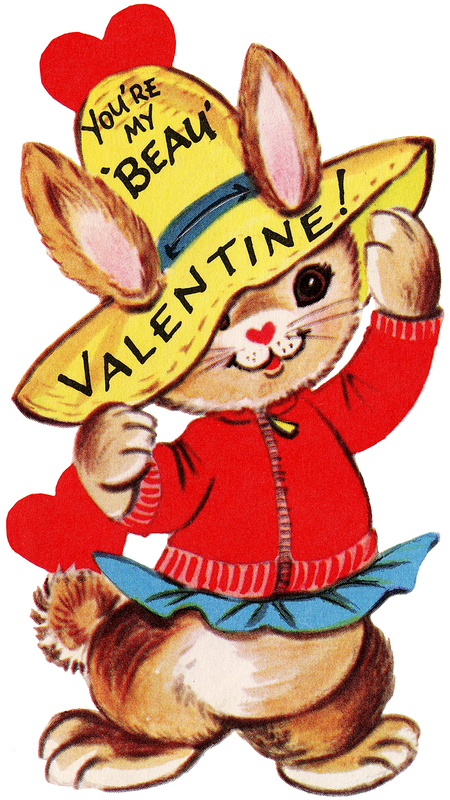 I adore this Cute Retro Valentine Bunny Image! This adorable Valentine Graphic shows a funny little Bunny with a big straw Hat! Here’s another pretty Valentine Image from the Retro Valentine Book that I have in my collection! This one shows a big Red Heart, some Lace, a yellow Butterfly, and some Flowers. Lovely! Isn’t this Retro Valentine Goldfish Image cute?! 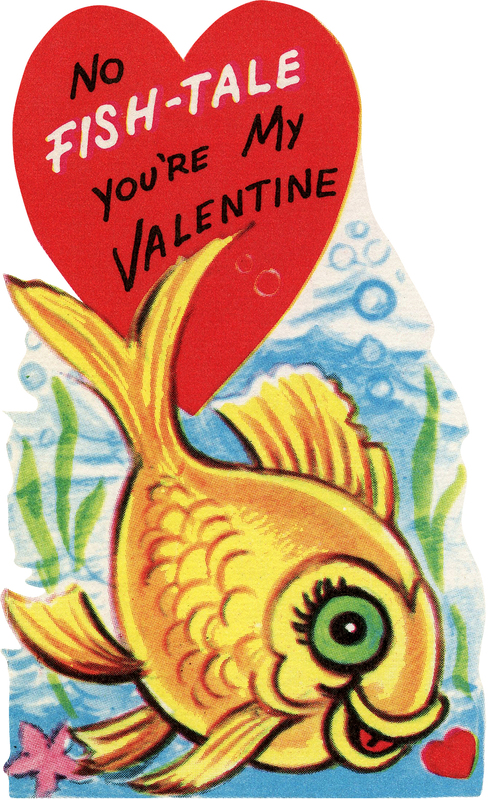 This adorable little Vintage Valentine features a happy looking Goldfish with big Green eyes. He appears to be blowing a bubble in the shape of a heart. Above is a fun Vintage Donkey Valentine! 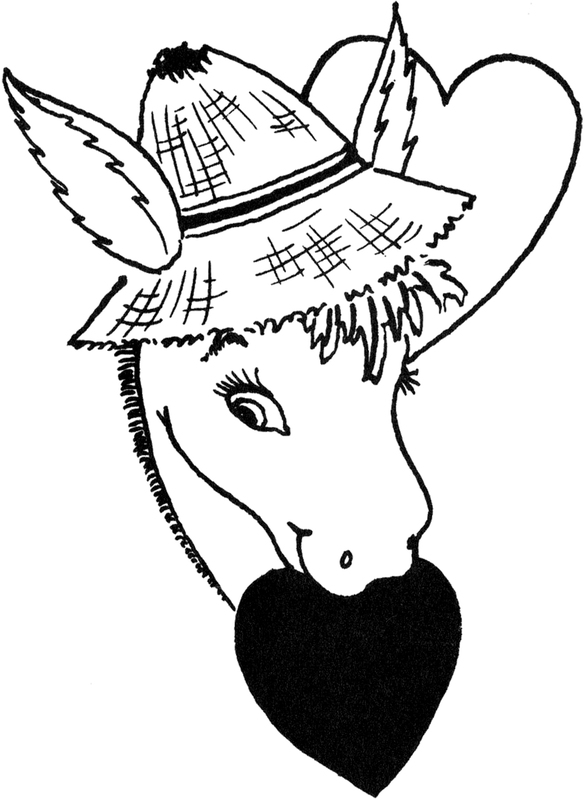 This cute image is a black and white illustration of an adorable Donkey with a Heart in her mouth! This one was scanned from the old Circa 1940s or 1950’s Valentine Activity book without a copyright. This is a fun Vintage Chicken Family Image! 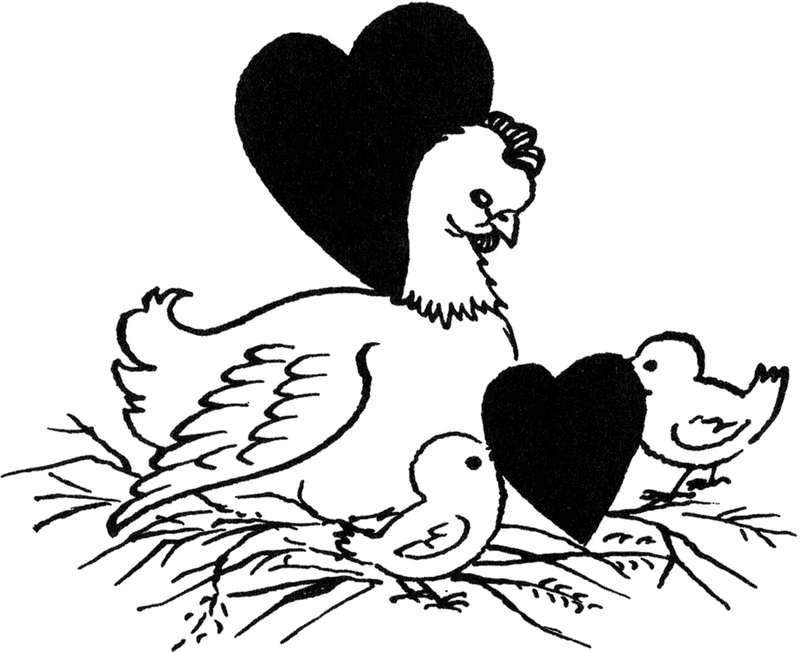 This cute image is a black and white illustration of a Mother Hen and her Two Chicks. The babies appear to be presenting the Mama with a Heart! It walso came from the retro Circa 1940s or 1950’s Valentine Activity book. I hope you enjoyed this curated collection of 9 Retro Valentines with Animals. 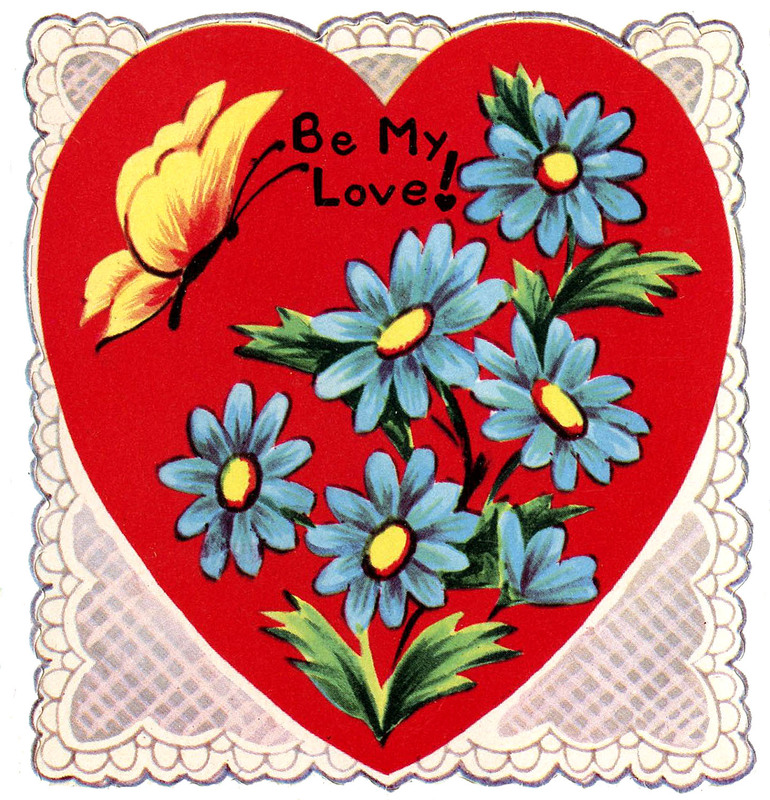 You might also like our or our 12 Colorful Retro Valentines with Children Images HERE or our 40 Free Valentine’s Day Images HERE! Retro Pansies Graphics Set – 7 Pieces -1950s-1940s 9 Cherubs and Hearts Images – Updated! 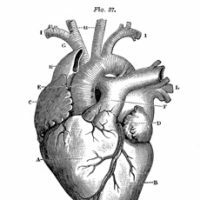 5 Anatomical Heart Pictures! « 5 Sweet Siblings with Hats! Cute beyond words! I have plans for this one. Thank you, Karen! Yay! I’m glad you can use it Cynthia! So sweet and cute! Thank you! 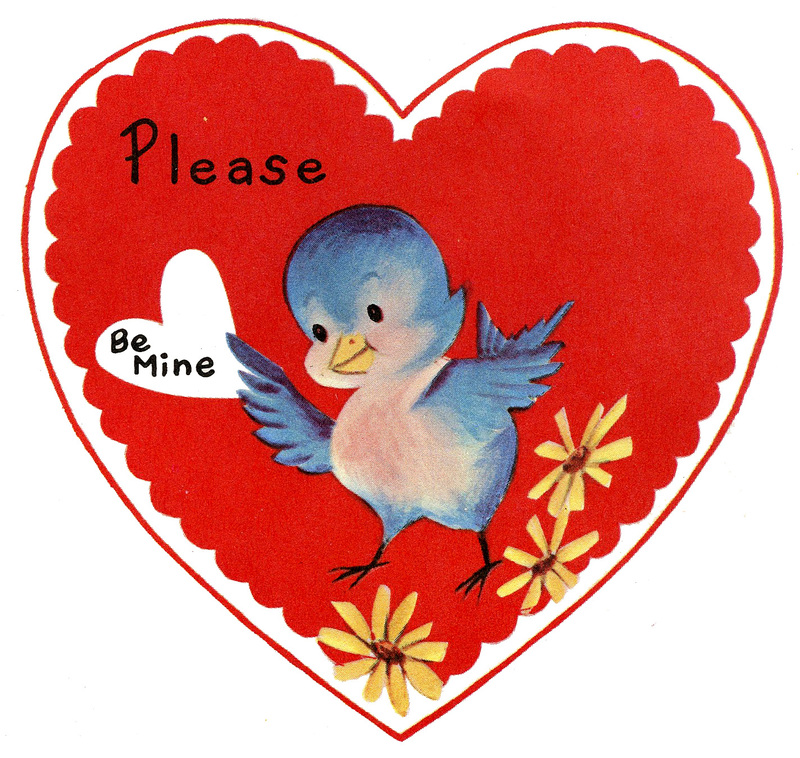 Oh, I just love, love, LOVE these vintage/retro Valentines you share with us!!!! Now my biggest problem is to decide which one to use…I’m not complainin’, it’s a good problem to have! THANKS!!!!! I LOVE these! Thank you so much for sharing them. They are wonderful! Thank you Chris, so glad you like them! Oh, these are adorable, Karen!